You’ll find me today at my new digs, considering whether consistency always matters. Please join me there, at the Chronicle of Higher Education’s new blog Lingua Franca. I’ve noticed something in my reading lately: children and young adults in print are disgusting eaters. It’s not that I believe that rudeness is on the rise. After all, real-life violent crime statistics have been in decline for years, and as a measure of civility—well, you can’t get much ruder than violent crime. Statistics on food-related violence, real or imagined, are more difficult to locate. Pies in the face used to be a staple in films and TV (not to mention that shocking grapefruit); are they still? Poor table manners and ravenous hunger are of course a writer’s shorthand for juvenile behavior. But giant handfuls? Stuffing as much cake as you can into your mouth? We talk this way (“he sat there stuffing his face”), but only two of the passages above are written in a character’s own voice. I’m looking for guidance here. I’m curious—but maybe I don’t really want to know. 1. Frances McNamara, Death at Hull House: An Emily Cabot Mystery (Chicago: Allium Press of Chicago, 2009), 192. 2. Kevin Wilson, The Family Fang (New York: Harper Collins, 2011), Kindle location 105. 3. Mary Downing Hahn, Time for Andrew (New York: Clarion, 1994), Kindle location 116. 4. Gunter Nitsch, Stretch (Bloomington, IN: AuthorHouse, 2010), Kindle location 2432. 5. Andrea White, Windows on the World (NH: namelos, 2010), Kindle locations 739 and 1335. 6. Gilda Joyce, Psychic Investigator (New York: Sleuth/Dutton, 2005), 157. 7. Gennifer Albin, Crewel (New York: Macmillan, 2012), 10. Yesterday I learned that my new blog home at Lingua Franca* does not use Chicago style. My first response was nonchalance; I know that not everyone uses CMOS. But overnight it hit me the way a sniffle on Wednesday is a cold by Thursday, and now I’m in full-bore whining mode. I have never in my life used any style guide but Chicago. And it hasn’t been a casual brand-loyalty kind of thing, the way I’ve always used, say, Alka-Seltzer. For decades, CMOS has been within arm’s reach, like reading glasses or a pencil. I’m what they call a “power user.” For pete’s sake—I’m one of its editors. I won’t cheapen my feelings by comparing them to cheating—on a diet, a lover. What I feel is not guilt or treason. It’s more like unreasoned homesickness and fear. I know Chicago style so intimately, so automatically. Typing the serial comma by now is as much in my fingers as in my brain. And on to the serious whining: I have to learn a new style! Go ahead and throw in my face my cheerful pep talking about learning CMOS 16. I don’t know how to learn a new style! I can’t even find online a serious list of the main points of NYT style—although a copy of the manual is even now winging its way to my desk. Until my copy arrives, I would love to learn some of the most common differences between New York Times and Chicago styles. I know about using Mr. and Ms. I know NYT eschews the serial comma. Please tell me what you know! Maybe that will bring relief. *At the Chronicle of Higher Education, beginning the week of August 29; I will post the link here each week. I just finished reviewing my copyedited manuscript and I learned a valuable lesson: I am a hack writer. 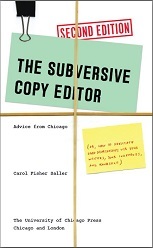 It has absolutely nothing to do with the copyeditor herself; she was professional and unobtrusive on the page. And before we go any further I want to say that based on her handwriting you, too, would have leaped to the conclusion that she was a woman, so don’t scold me. No, what made me feel like a hack were the corrections themselves. I’m supposed to be a writer, after all. I’m supposed to know grammar, and how to punctuate, and how to (for crying out loud) spell. So why the heck do I use so many em-dashes? Wait, is that actually spelled m-dash? Or perhaps it’s em dash. And why do I abuse commas so violently? There are spaces between the periods of ellipses? Now you’re just making stuff up. But really, how can a supposed writer not know the appropriate context for “into” versus “in,” and “onto” versus “on”? And while we’re at it, why do you hold onto a rock, but you search for something to hold on to? Why do you pull a car in to the lot, but you settle your child into bed? How the heck do foreigners learn this language? Oh, yeah, I also abuse italics. I mean, left overs? That’s seriously two words? GET. OUT. Overs isn’t even a thing! But there are more substantive issues, too—language I would have screwed up even if I had bothered to open Webster’s Eleventh while I was working. I once wrote a haughty blog post about tic words in young-adult books—they annoy me as a reader and keep me from feeling transported by the prose. And then I noticed little check marks on my manuscript, like snowflakes dancing down the page. It turns out those check marks appear over repeated words. Gah! I hate myself! At the end of the whole process it was impossible for me not to wonder: did the copyeditor like the book? Did she think I was below or above average in how pathetic my mistakes were? Does she wonder whether I respect her expertise and effort? P.S. Carol Saller did not copyedit this post. For over a year, I’ve been turning up here weekly to rant and fume and share, and on my part, it’s been pure pleasure. I hear from enough of you to know not only that someone is out there listening, but that almost anything I’m experiencing in my life as a copyeditor has been similarly experienced by at least some of you. It can keep a body going! I’m very grateful. But now there’s something new. Starting the week of August 29, I’ll be moving to a new daily blog called Lingua Franca at the Chronicle of Higher Education. Lucy Ferriss, Allan Metcalf, Geoffrey Pullum, Ben Yagoda, and I will focus on language and writing in academe. I’m excited by the challenge and by the company. In other news, my children’s novel, Eddie’s War, was published this week! Set in rural Illinois during World War II, the book is a coming-of-age story about a boy too young to enlist. I hope you’ll take a look—if you read it and like it, please feel free to say so at Goodreads or Amazon. Meanwhile, Clara Gillow Clark invited me to guest blog about it this week; if you’d like to hear more, hop on over there. So . . . today is my last regular Wednesday post at this site. I expect future posts to be somewhat sparse and random, but I hope you’ll keep me in your feeds. And I hope we can continue our conversation at Lingua Franca. Thank you for being here. I hope I see you there. I’m guest blogging today at Clara Gillow Clark's children's book blog, launching Eddie’s War and telling about how I got into trouble writing it.